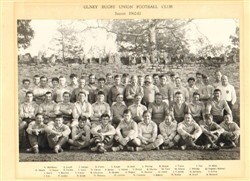 Olney RFC, black and white team line-up photograph season 1962-63. Back row: R. Middleton, S. Lovell, J. Gudgin, D. Clarke, S. Knight, D. Body, L. Whiting, R. Mason, J. Taylor, I. Tew, D. Miles. Second row: R. Meech, G. Stacey, E. Inchley, T. Jones, D. Adams, P. Barker, J. Walker, T. Bowler, B. Haynes, M. Field, M. Adams, J. Whiting, D. Tranter (Referee). Third row: J. Harris, B. Barcock, T. France, R. Checketts, R. Sargent, A. Walker, N. Swallow, G. Odell, J.V. Smith, R. Howkins, A. Driver. Front row: I. Cox, P. Inchley, D. Kemp, D. Maloney, D. Griffiths, N. Campion, J. Brimley, R. Wesley, R. Jewell, A. Mustard.